AMSOIL PC Series Oil in the appropriate viscosity is recommended for use in single and multistage rotary screw, vane, centrifugal and reciprocating compressor crankcases and cylinders, vacuum pumps, pressure washer pumps and other applications such as gears, bearings, blowers, pumps and handheld pneumatic tools. In compressor applications, drain intervals of 8,000 hours or more can be expected under normal operation. Drain intervals are subject to operating conditions and maintenance practices. Monitoring by oil analysis is recommended. 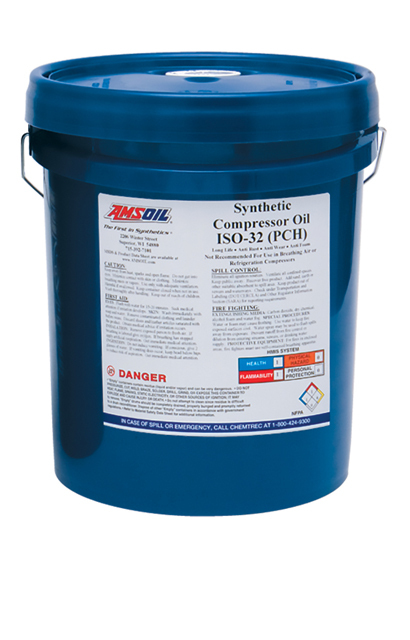 For best performance when converting to AMSOIL PC Series Oil, it is recommended the compressor be flushed of the old oil and all filters changed prior to the installation of PC Series Oil. If carbon deposits are present on the internal components, it is recommended they be removed following the compressor manufacturer recommendations.